At an altitude of 5,200 feet, life in Oaxaca comes with a break-in phase for a sea-level-lifer like myself. The highest I’ve ever lived is about 3,000 feet, so this has been completely new (wheeze-wheeze-puff-puff) for me. There are those who claim life at 5,200 feet isn’t a big adjustment, but all the transplants I’ve met here say they took up to a week to adjust to Oaxacan elevation. Day 6, baby. During the days, I’ve been a little tired, but, at night, boy, I’ve lain there at times feeling like a small child was sitting on my chest because it was so much more difficult to breathe. My nose would close up from the dryness of both the thin air and the desert aridity, and I found myself breathing through my mouth all night, resulting in cotton-mouth and cracked lips. There is no quick fix. It’s a matter of more than the body learning to adapt; your physiology must adapt too. That means blood vessels expanding a bit, red blood cell production escalating, and just taking the time to let all that unfold. A temporary “taco alley” is set up and it’s perfectly in line with the sunset on these hot April days. At the sixth-day point, I still get a bit winded and such, but I speculate the heat has a lot to do with that as well. It’s been between 31 and 35 degrees daily and the cool nights I had been promised haven’t been happening at all in my apartment, though outside it does drop a good bit. My apartment falls victim to heat retention. The humidex has been telling me horrible things, like “it feels like 43 degrees Celsius.” Gah! I’m fish-belly white! I’m made for winter, spring, and fall! Still, I think the acclimation point is drawing near and I’m finally beginning to feel human again after my first two nights with 7 or so hours sleep in a row, unlike the 4 hours sleep I averaged for 10 days straight. I’m settling in at home, too. There were some hijinks with my apartment plumbing and some getting-used-to-things. First, the bathroom faucet bit the big one and the plumber took two days to come fix it (then did a great job). Mexico, man! Now the water has run out in the building, and a water truck is coming tonight to refill the reservoir. We’re not in Kansas anymore, Toto. Yesterday saw me suffering awful back problems thanks to the joys of hauling a 5-gallon jug of water home to drink, since tap water is unsafe and the mix of altitude/heat means I’m drinking 5-6 litres a day just to stay hydrated. I’ve overcome both the stupidity of making the choice to challenge The Big Bottle and the pain, thank goodness. 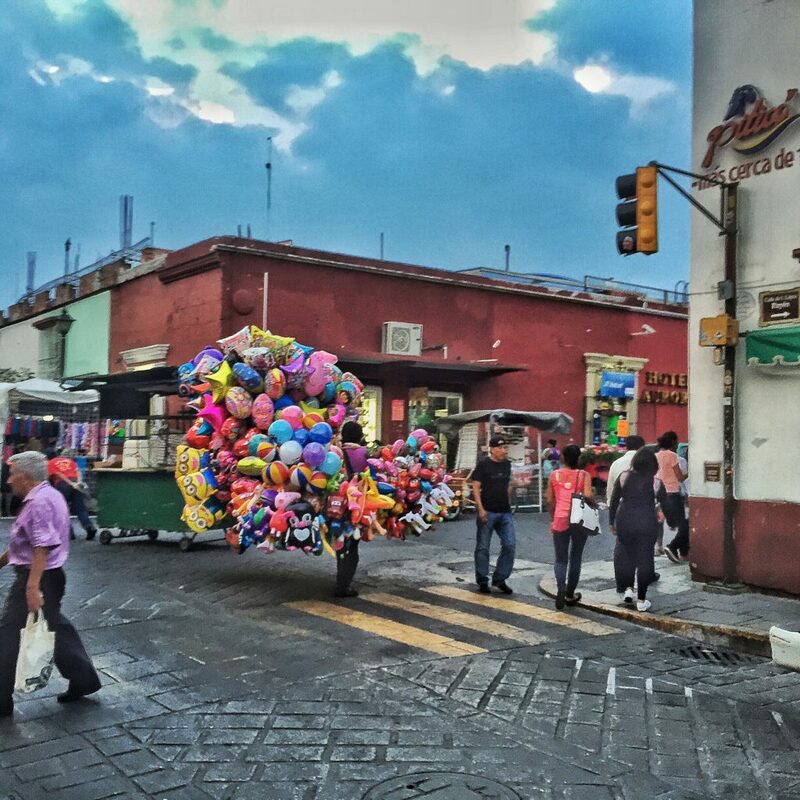 Balloon guy battles brisk winds and narrow streets en route to the zocalo to sell balloons to families. Being abroad in a “local home” as opposed to a vacation rental means learning how to live a little differently. And it’s not without its rewards, either. I’ve eaten street food and lived to tell the tale. I’ve had local specialties like tlayuda. (So good.) I’m off the tourist beat, and I like that. As I type, a street-fooder is walking his cart past and tooting his clown-style horn repeatedly to summon customers. There are different calls and summoning sounds for all the various street merchants on their bikes or pushing carts filled with food. If it’s not one of them, it’s a diesel truck rumbling past, children laughing, or dogs barking. Silence isn’t a natural state here in Mexico, it seems. Six days in, it’s safe to say I’m only now starting to feel like I’m getting a sense of this place, but I also understand it’ll be a long time before I really get the feel for Oaxaca. So far, though, I really like it because I’m falling in sync with the lackadaisical ease of being in authentic Mexico. I feel relaxed and at peace with myself. I think the slow lifestyle has found me fast, and maybe I have altitude sickness to thank for that. My expectations have waned, my demands upon myself have given way to a realization that pushing myself to see All The Things is foolish. Time is on my side for once. I’ll be here for up to a couple months. 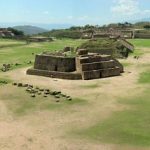 Something is niggling at me now, the travel bug, I guess, because I’m thinking that if this place offers so much to see and do, what else should I be taking in during my potentially 6 months in Mexico? I’m beginning to wonder if I should spend two months in each of three places. So, I’m thinking about that and I’m torn. But I’d be lying if I’d said I’d seen anything more than a few precious blocks of this town. I was plum wore out after two months of breakneck travels and experiences. Between January 31 and April 6, I changed lodgings 17 times. I’m not rounding up. I mean 17 times. It included several places in Canada across four cities, with four lodging changes in Vancouver alone, three in Victoria, plus Edinburgh, Manchester, London, and three stays in the Azores. I averaged 3.88 days per lodging. Between that badly planned stupidity, the heat, and the altitude, I’ve been happy to take it slow this week. Yesterday I napped four times. Today, twice so far and I left the house at 1! But if I think I’ve got it hard, it’s not even close to the life this guy lives. 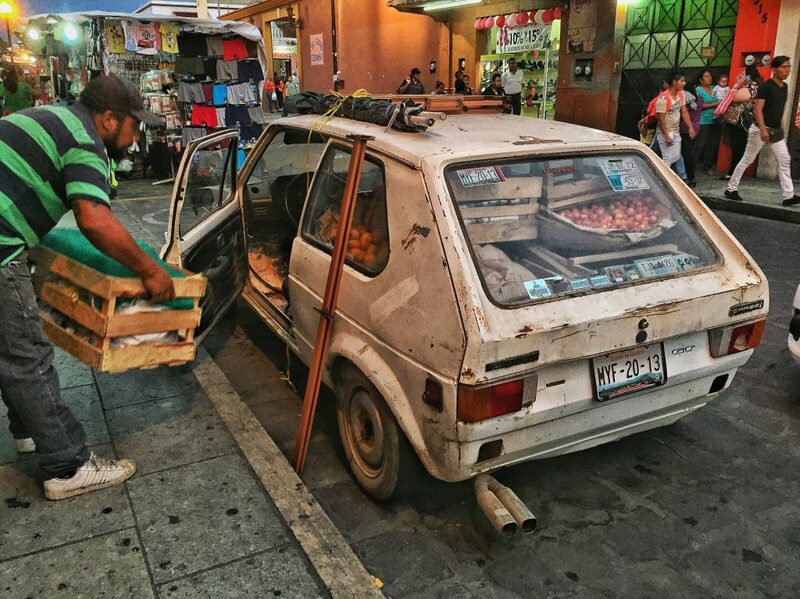 Here he is packing his car after a day of selling goods on the street. Obviously, with so little seen or done, there’s not much for me to tell you about. I’ve sussed out placed to buy water, have visited a supermarket, wandered the Acala pedestrian mall in the evening, and eaten tasty things. Beyond that, Mexico is an experience that is more ahead of me than it is in my present. One thing I do know is that I’ll have to learn Spanish, and fast. I succeeded in ordering breakfast in Spanish yesterday when the English-speaking dude was tending tables. I think I said yo quiero huevos a la Mexicana y frijoles y aguacate, por favor, and I think I said medium-hot when the grillmaster said a bunch of things and “picante” was one of the words. I held my finger and thumb in the pinching “just a little bit” sign that seems to be universal. “Si, si!” Today, though, attempting to order an iced coffee was a bust. People seem amused by my attempts. I have a woeful grasp of accents. I also live on a street I suspect I will never be able to pronounce. Without learning the language, I fear the real Mexico will escape me. I’m not optimistic about learning this, since my grasp of languages is weak at best, and I’m given to thinking so much in English even when I’m trying to speak the native tongue, but I’ll work hard and maybe in five or six months I can laugh about how ineffectual I once felt in speaking Spanish. Meanwhile, I’m drinking a traditional beverage called Tejate, which Oaxacans call the Drink of the Gods. It has fermented cacao beans (not chocolate) and maize along with ground cacao flowers and mamey seeds. The best tejates, apparently, are made with the maize cooked in ash water. There’s a bizarre lumpy texture that makes me think of quinoa in soup, but it’s actually a very nice drink. It’s easy to think “chocolate milkshake” when you look at it, but not by a mile. Learn more about tejate here. Soon, I’ll tell you all about some of the food I’m falling in love with in Mexico. Gone are the days where I’ve only ever had tacos and enchiladas. If you’d like to see my day-to-day photos, be sure to “like” my Facebook page by clicking here. Follow my Instagram here. It’s hard to do anything much when it’s so hot and the altitude is so high so I hope you’ll take it easy on yourself and just take it easy while you’re there. 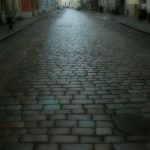 I love your photos, the colours are exceptional. Assuming you have a smart phone, the free app Duolingo is really great, and includes Spanish as one of its base languages. I did a fairly mediocre job of using it before our Italy trips, and the bit I did retain helped immensely!